Following our recent announcement that the theme for the 2017 US Trail Running Conference is: Making Strides in Innovation, this is the next in a series of posts focused on participating sponsors and our expert panelists on how they have used innovations to drive their products, service and races. How long has Adidas been involved in producing running footwear? Since the 1930s, and developed the first trail running specific shoe, then called off-road running. Innovations have been a foundational factor for Adidas across many sports. Can you share some of the innovations that Adidas has brought to running shoes? Too many to count, so I will highlight the ones that we use in the Outdoor Division. Boost foam, a highly responsive and exceptionally durable midsole foam that allows athletes to perform at their best longer. Continental, a collaboration with one of the worlds best rubber manufacturer, to use the best selling mountain bike tire patterns, to inspire our outsoles that give us the best grip in the business. The use of sustainable materials has often been led by European manufacturers. How has Adidas contributed to this trend and what sustainable innovations can we expect to see for future running shoes from Adidas? In 2018, in collaboration with Parley for the Oceans, Adidas outdoor will debut trail running shoes and apparel made with recycled plastic pulled from our planet’s beaches. Including plastic from beaches in Hawaii, Alaska, and Maine. Sustainable materials have been used by Adidas and other outdoor companies for decades, we have lofty goals to be using 100% recycled plastics in the near future, but we are also focused on reducing the amount of water, and energy we are using in both our factories as well as our facilities around the world. 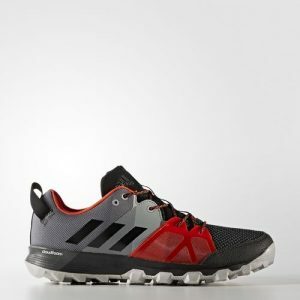 How important is the trail running market to Adidas, and can you share what products we might see in the stores in the near future? Trail running is very important to Adidas. Our line of shoes continues to grow, and you know you can always expect the best technology, and innovation in Adidas products. You attended the US Trail Running Conference with Adidas in 2016. What did you like best about last year’s event, and what are you looking forward to for this year/s Conference? I really enjoyed the speakers last year, and look forward to more interaction with athletes and race directors this year. Can you tell us one thing that is uniquely Loren that no one would know by looking at you? Come and check out the adidas range of trail running shoes at the expo for trail runners on Saturday, October 14 (8.30 am to 5.30 pm) at the Stanley Hotel, Estes Park, CO – register at this link. This entry was posted in adidas, stanley hotel, trail race directors, trail running, trail running conference and tagged adidas, american trail running association, atra, estes park, stanley hotel, trail running, trail running conference. Bookmark the permalink.